And just in time for 4th of July! This is side #2 for the sheep doorstop. Progress has been made but it's definitely not finished. I have nothing more to share at this point. 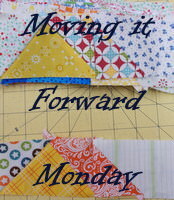 See you when I return from Colorado for 2 days before heading out to quilt retreat! I hope to have LOTS to share then! Enjoy the rest of June and stay cool! June is just going to be spectacular! I can feel it in my bones! "Why?" you may be asking? Because I checked out the APQ 2016 UFO Challenge project for June. It's #10 which from my UFO list is this beauty! I looked back on my original post which listed my UFO Projects and I incorrectly called it Hugs & Kisses by Gudren Erla. Well, it is by Gudren but the pattern is called Riptide. Close, right? Ha! After careful inspection, I discovered that I was actually organized! Inside the box was not only the assembled top, but the fabrics for 2 borders, backing, and binding!!! Whoa! Impressed myself!!! I thought I'd also share a couple of things I'm working on. 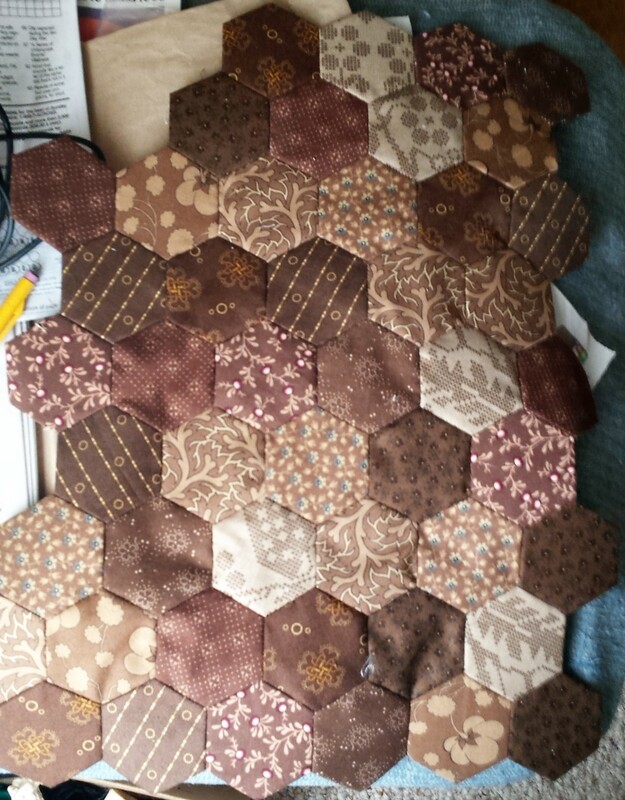 The first is a hexagon project from the Spring 2016 Primitive Quilts & Projects magazine. The project is called Keeper of the Door. It's designed to be a lamb door stop but I may just keep her on a shelf. Anyway, you sew the hexies together to make the fabric for the sheep's body, stuff her, and make her head. The picture to the right is my current work station. The picture on the left is the "fabric" for one side of the sheep. After the sheep is complete, there is a blanket that you can drape over her back with a homey theme. 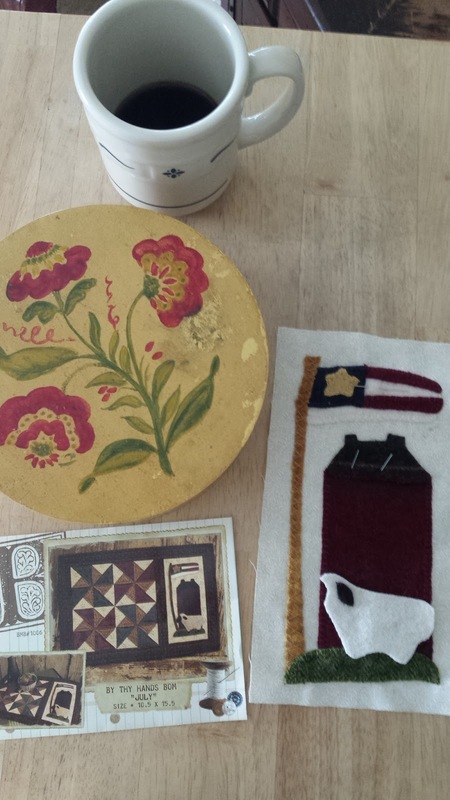 It can be completed one of three ways: cross-stitch, wool applique, or punch needle. It's very cute! Who knows? It may just go up at my guild's auction! 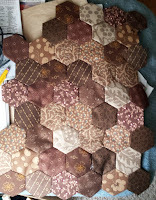 Lastly I'm also working on a candle mat by Buttermilk Basin. She did a monthly series of the mats but I know my limitations -- I'd never do all twelve so I picked up a few that I really loved. I also don't use them as candle mats but as small wall hangings. This one is the July pattern but I'll use it all summer. Current progress: My pinwheels are all stitched and I'm working on the appliqued 4" x 8" panel. 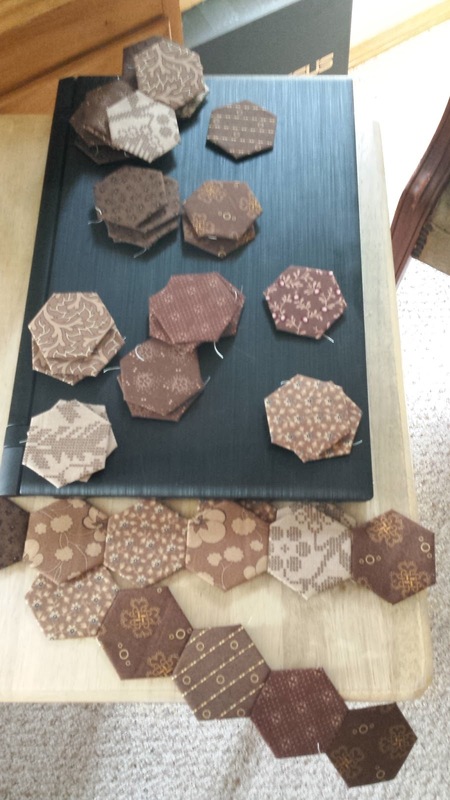 These are quick to quilt up so it shouldn't take long before it's hanging! I'll keep you posted on that! You've read this post this far so let me tell you another fantabulous reason why June is going to be a great month -- My daughter from Alexandria, VA will be attending a conference in St. Louis and will be spending extra time with us! Ten days of wonderful! Have a great day and I'll check in with you later!